I have a prism hanging in my dining room window. 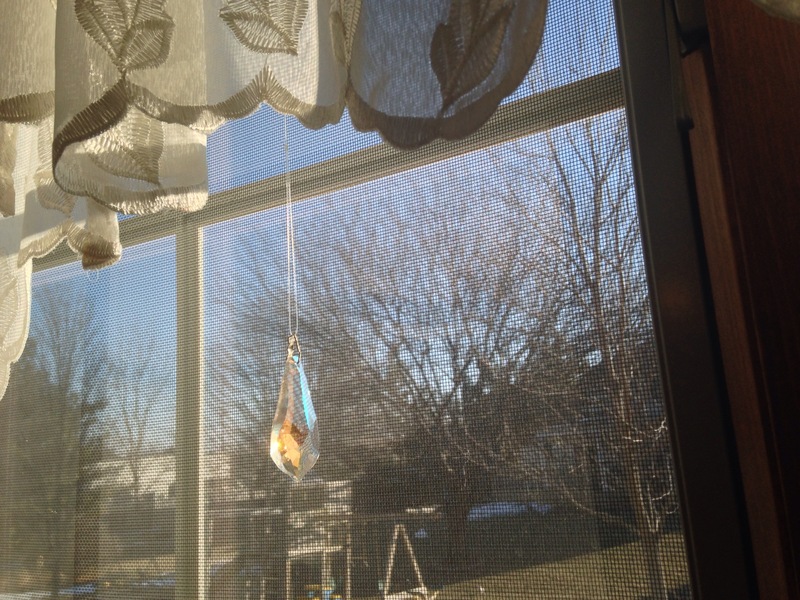 The heat vent underneath the window is making the prism swing gently from side to side. It is an east facing window with morning light. Blue dog is chasing rainbows in the living room. Well, more like light swatches at the moment, that move across the floor to the furniture, walls and back to the floor again. I knew he liked chasing the cat’s laser light, flashlight beams and the sunlight glint from his collar tags. Now rainbows via prism light. Blue also stops to smell the flowers, takes me on startlit/moonlight walks and woofs to go out in time to catch the sunrise/sunset. May you have a blessed rainbow chasing day. Woof. Thank you for the enlightenment, my friend.